Fitzwilliam Darcy was in very grave danger. Now, one may very well wonder what could have been so terrible that it could cause a man of sense and education, who has lived in the world, a man who also possessed the means and resources to achieve most anything he could wish to live in fear. This terrible thing in actuality wasn’t very terrible at all. It was simply a pair of very fine eyes found in the face of a pretty woman named Elizabeth Bennet. He told himself that it would never do, as fine as her eyes were, as much as she had captured his interest, it could never be. Walking along the pathway that ran through the wood of Bingley’s leased estate, he had sought to put as much distance between himself and Miss Elizabeth as he could. Originally he had hoped to spend some time in quiet solitude, but Miss Bingley was about and just the idea of being on the defense all day made him weary. Had it only been yesterday that the Bennet sisters were still here? It seemed to Darcy that he had been bereft of his Elizabeth’s company much longer. Today he was safe. He was on the far side of the Netherfield property and, by his estimation, that would put at least five miles between them. It was really for the best. Elizabeth Bennet was having a very trying morning. Since arriving home from Netherfield, Mrs. Bennet had not stopped chastising Jane for her inability to secure Mr. Bingley. Lizzy felt the full shame of having such a designing, mercenary mother. She knew Mrs. Hurst and Miss Bingley already believed the Bennets to be fortune hunters and it hurt that her mother’s actions just seemed to confirm that in everyone’s eyes. Lizzy had desperately needed to escape Longbourn for a few hours. Cousin Collins had surprised everyone by arriving much earlier than he had warned in his letter. The good parson had arrived just as breakfast was being laid out and he began by expressing his wish to complete the mission his noble patroness had sent him on. Mrs. Bennet, being silly but not a fool, had found a way to at last be rid of her most troublesome daughter and directed Mr. Collins to pay his attentions to Elizabeth. While one of Elizabeth’s favorite pastimes was making sport of other’s vices and follies, she had no wish to be partnered for life to such a never-ending font of ridiculousness. So, with a word to her father that she was leaving, she escaped out the back door through the kitchen. Not wishing to encounter the ladies of the Netherfield party in Meryton, she decided to take the paths that wound along the back of the property towards the mount. At least there she could be alone. As Elizabeth walked, her mind betrayed her wishes by recalling her conversations with that most infuriating of all men- Mr. Darcy. She could not make him out at all and it was driving her to distraction. There were moments when he seemed he might be somewhat amiable. She reasoned that he must be at least somewhat so in order for him to be friends with such a congenial fellow as Mr. Bingley. Just when Lizzy would begin to feel Mr. Darcy might truly be a gentleman, he would say something that confirmed again the low opinion she had formed of him at the assembly in Meryton. His character was not easy to make out at all and it was greatly vexing. Lizzy was nearing the top of the mount where she hoped to sit on her favorite outcropping and bask in the warm autumn sunshine before returning to the chaos she was certain Longbourn was in. She was lost in thought- in truth she was thinking about what a tragedy it was that such a handsome man as Mr. Darcy should be so taciturn, proud and disagreeable to everyone he meets- when she noticed on her approach that her favorite rock was already occupied. That the man who was plaguing her free moments should have the audacity to also occupy her favorite spot on Oakham Mount was simply too much! Why must he be everywhere? If he found Hertfordshire and everyone in it so undesirable, why would he not simply leave? Elizabeth Bennet, known well for freely giving her opinion without regard for consequence, was about to let the rich, young man of 10,000 a year know that all the money in the world was not enough to put up with his company when it came to her attention that Mr. Darcy was not alone. Lying next to him was a gray tabby cat who gave every appearance of enjoying having its belly scratched. Lizzy could not have been more shocked than if Miss Bingley took to milking cows! Lizzy silently moved closer so she could further investigate the scene. Mr. Darcy was not only petting the cat, he was having a decidedly one-way conversation with it! Elizabeth knew she should leave, that it would be unconscionable to eavesdrop, but could not help herself. The Tom mewed and batted Darcy’s hand when for a moment the chatty gentleman had stopped petting him. Elizabeth was dumbfounded and speechless. She knew she should not be watching the scene before her but she had not the wherewithal to leave or look away. Elizabeth had already been greatly shocked by his confessions and was anxious to hear what he would say next. What could he have done? The cat said nothing in reply and Elizabeth also kept her silence as well. Considering that for the entirety of her acquaintance with Mr. Darcy, she was certain he had never looked at her but to find a blemish , had never spoken to her but in condescension, to say that she was astonished by these revelations of his feelings for her would be a gross understatement. Elizabeth had already reviewed all her interactions with Mr. Darcy earlier that morning. However, his admission of love and admiration altered her earlier perception and she began to see everything in another light altogether. When she had thought they fought in the drawing room, she now understood he believed it was a friendly debate. Before when he asked for her opinions she believed it to be for the sake of ridicule, but now she knew he had held genuine interest. And the constant staring that she’d perceived was to find her many defects, well, that was something altogether different as well. Had she been so prejudiced by her perceived slight that she was unable to see him for the man that he was? When she had first spied him at the assembly, she had thought him to be the most handsome man she’d ever seen. If she was honest with herself, he still was. He truly saw her as an equal, as someone he could love and cherish. With Mr. Darcy, she would never be an ornament to simply adorn his arm or keep his home. Mr. Darcy was highly educated but never sought to make others feel low for not having the same advantages, his liberality as a master had been spoken of nearly as much as his reputed income and he was obviously a good friend and a caring brother. These were all things highly in his favor and the more she considered the idea, the more she reflected on her time spent with him, she came to realize that he was nowhere near as severe as she had originally thought. Would she, could she, give him a chance should he ask for one? As she watched him continue to pour his heart out to a cat of all things, Elizabeth knew the answer was yes. Knowing that she was in a precarious situation, Lizzy weighed carefully her options. She could leave quietly or she could make her presence known. Not feeling up to meeting with him just yet, she opted to leave the way she came so as to give her some time to understand the new emotions she was feeling. As is so often the case when stealth is required, she could not escape without detection. Elizabeth had not payed enough attention to the pathway before her and stepped on a dried branch that cracked loudly underfoot. Quickly she spun back towards the mount, giving the appearance of just having arrived. Upon hearing the twig snap, Darcy’s attention turned towards the noise and he smiled broadly at the vision presented before him. Elizabeth stood there, cheeks flushed from her exercise, her hair blowsy from the warm autumn breeze and in particular he was pleased to see her petticoats six inches deep in dust. This was the sign he had been waiting for! It must be so, for it would be too cruel a coincidence to be otherwise. The longing in his eyes, the tone of his voice and the look of love upon his face made her decision for her. Elizabeth believed she would enjoy getting to know this enigmatic man and looked forward to a courtship with him, should he ask. Ask, he did. They spoke of many things in the hour and a half it took to meander back towards Elizabeth’s home. She was as pleased as he to discover they shared many of the same tastes in books and music. They discussed their families; both the good and bad parts and each realized that no family could be completely exempt from an element of the ridiculousness. With only a quarter mile left in their journey, Darcy gathered up what courage he could and pressed his suit and was happy to find that Elizabeth bade him to seek permission from her father. Over the next month, Elizabeth Bennet was fervently courted by Fitzwilliam Darcy. The notion had taken Mr. Bennet completely by surprise. Never in his wildest imaginations did he think that the outwardly dour man from Derbyshire would seek his favorite daughter’s favor any more than he believed she would wish for such attentions. If anyone from Netherfield had been expected, it was Bingley to seek Jane. That Darcy came first was definitely a surprise. Bingley overcame the objections of his sisters and eventually sought his own audience with Mr. Bennet. The more the gentleman from the neighboring estate came, the fonder Mr. Bennet grew of his would-be son-in-laws. Bingley was a very cheerful fellow and would do very well for Jane. Darcy was another matter entirely. His character was not so easily revealed but the longer Bennet was acquainted with Darcy, the more he grew to appreciate the man who was so obviously in love with his daughter. If nothing else, Mr. Bennet would need to credit the young man with exceedingly good taste. Mr. Collins eventually found that Charlotte Lucas both welcomed and accepted his addresses. His company had grown tiresome and the inhabitants of Longbourn were not sorry to see the future master of the estate go on his way. All talk of being stranded in the hedgerows was forgotten in light of the eldest Bennet sister’s wealthy suitors. When the militia came to Meryton, it was discovered that residing amongst them was the very villain who had caused so much trouble for Darcy. George Wickham’s accusations of mistreatment went unheard as by the time he arrived in town; Mr. Darcy’s character was known to be of good moral fiber and as such, was trusted implicitly. Darcy even was able to influence Mrs. Bennet to keep her younger girls in check by not sending them off to flirt with all the officers. Instead, he slyly suggested that their attentions should be focused on becoming more accomplished so they stood a better chance of making a great match. Normally, disguise of every sort was his abhorrence but in this matter, he found it perfectly acceptable to prevaricate. He explained that when the girls would visit their sisters in London, they might just happen to come into the path of other rich men. To Mrs. Bennet a rich man beat a red coat any day and so there was no more talk of soldiers at Longbourn. On November the 27th, the day after the Netherfield Ball, Darcy showed up very early at Longbourn. Again to Mr. Bennet’s surprise and delight did Darcy surprise him. Darcy told Mr. Bennet that Elizabeth had consented to marriage at the Ball and now was standing in the Bennet library asking for the elder man’s blessing. Mr. Bennet had come to see that though he would enjoy Bingley well enough, he would always respect and admire Lizzy’s husband best. Several weeks after their engagement was announced, fate found the happy couple alone, whether by design or accident is unknown, atop Oakham Mount. Since that fateful day many weeks ago, Elizabeth had taken to teasing Fitzwilliam just to see if she could coax his dimples out of hiding. Today was no different. She was on a quest for information. She laughed and Darcy was enchanted all over again that he had somehow earned this marvelous woman’s love and affection. They each took a moment to release the laughter that had been building during this exchange of affectionate teasing. “Simply this.” Darcy reached over and with his eyes he asked for, and by her eyes, was granted permission for a kiss. He had kissed her hand before many times; he had kissed her forehead and cheek as well. This kiss was different. This was a kiss of apology, of love, of promise and of hope. With his lips pressed tenderly against hers, it was understood between them both that he never would find anything in her less than tolerable and, indeed, never had. When Elizabeth recovered from the warm haze of love’s first kiss, she smiled lovingly at her fiancé and expressed her wish that in the future he should always apologize in such a manner. Darcy, gentleman that he was, of course acquiesced to such an easily fulfilled request. 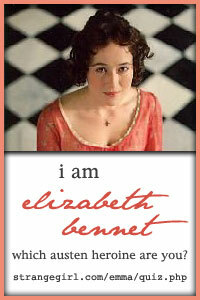 Elizabeth Bennet blushed from the tips of her toes to the top of her head. She had known all along that someday she would confess her having been privy to his conversation with the tabby. Now came the moment she had dreaded. What reason could she give for having eavesdropped and, more importantly, would he be able to forgive her? Turning away from him, she covered her face with her hands in sheer mortification. She began to sob that he would never trust her, never respect her and worst of all, love her no more. They continued discussing the future and making the sorts of plans that only young people in love can. It was only a few weeks later that Elizabeth exchanged the name of Bennet for Darcy. They used that afternoon at Oakham Mount as a pattern for dealing with whatever problems arose with honesty, love and understanding. The love that Fitzwilliam and Elizabeth Darcy shared indeed proved to be more than enough for one lifetime.